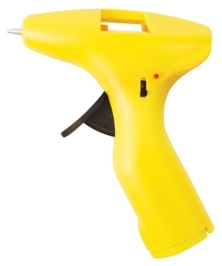 While spending an enjoyable browsing session in Maplins I spied a Cordless Glue Gun (Code N18HW). I have to say the low cost was almost a 'put off' as I was doubtful about the likely performance of this device. It is powered by 4 AA cells and uses 7.4mm x 120mm glue sticks. It promised a steady glue flow with non drip facility, at a temperature of 110°C. My doubts were in fact totally unfounded and it has proved to be a really good piece of equipment. The element heats up very quickly, just a few minutes, and the trigger mechanism controls the glue flow smoothly and effectively. What makes it so useful is that it produced a really small fillet of glue, so is perfect for reinforcing small foam models where the output from a standard glue gun would be excessive It you build and/or fly small/micro size aircraft this gun is perfect for use in their construction and/or repair. I can't give details about battery life as I'm still on the originals but provided the gun is not forgotten and left on for a long period I can't see this being an issue. I was held up getting the glue gun by the fact the Maplins I tried didn't hold it in stock and it was a couple of months before I had other items to merit a mail order purchase. Initially I was concerned as it took over 7 minutes to warm up with the re-chargable nicads I chose to use rather than the recommended AA cells. It seems that this was a "first use" time and now that the glue stick has melted into close contact with the nozzle walls the warm up time is about 2 minutes. The reduced voltage of high capacity nicads compared to conventional AA cells doesn't seem to have caused any problems. I have used it on several small "bodgy" type jobs where its small size and convenience of use without at power chord made its purchase worth while. What decided me to write this was the way it dealt with holding light weight but springy wire in place inside an aileron slot. A standard glue gun was too large and I don't know how I would have got the "instant hold" needed with another type of adhesive. This morning the Maplin site Cordless Glue Gun (Code N18HW) said:- "Cordless Glue Gun, only £3.99 While stocks last" Sounds like they are not going to continue selling the gun. So now is the time to buy if you think you might need this useful tool.